WIN - Discover Dogs Show Tickets - The Turtle Mat Blog - For news, features and competitions! The Turtle Mat Blog – For news, features and competitions! Rebecca Wilson on the subject of Competition. Posted on November 6th, 2013. 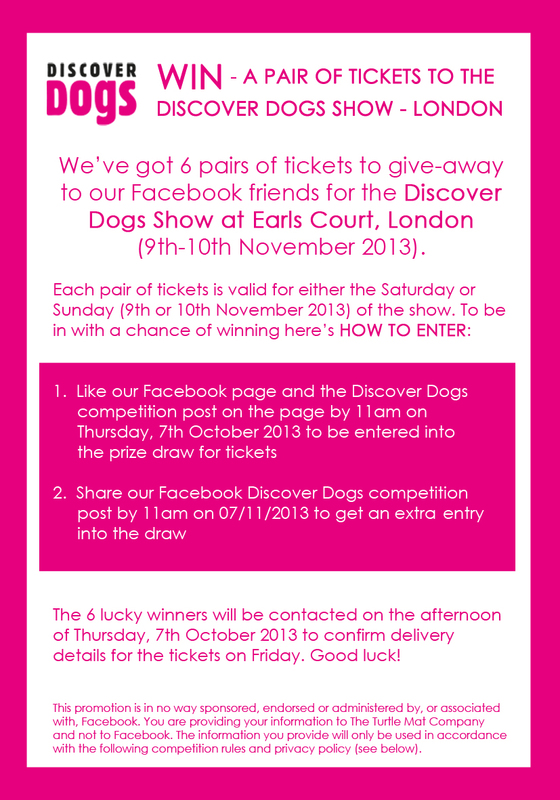 If you are one of the lucky six winners of our Discover Dogs prize draw, we will contact you via Facebook message associated with your entry(supplied via www.facebook.com/TheTurtleMatCompany) and ask for your full name and address in order to send you your prize on the afternoon of Thursday, 7th November 2013 to arrive on Friday 8th November 2013. Only the Turtle Mat Company Ltd. and companies working for the Turtle Mat Company Ltd. have access to the details you provide and we do not share them with anybody else for their marketing purposes, without your permission to do so. The prize draw closes at 11am on Thursday, 7th November 2013. The six prize winners will be notified by The Turtle Mat Company Ltd. by 2pm on Thursday, 7th November 2013, via the Facebook details supplied when entering the draw (see above). Entries must be submitted by liking the Turtle Mat Facebook page and the Discover Dogs competition post on the Turtle Mat Facebook page and an extra entry can be obtained by sharing the competition post via Facebook . Entries submitted by any other method will not be accepted. The competition winner will be contacted personally. In the event of their being no reply from the contact details (Facebook) supplied by the winning entrants The Turtle Mat Company Ltd. reserves the right to offer the prize to a runner up or withhold it for use in another competition. The prizes – six pairs of tickets to the Discover Dogs Show in Earl’s Court, London of must be taken as stated and cannot be deferred. There will be no cash alternatives. The Turtle Mat Company Ltd. reserves the right to cancel the prize draw at any stage, if deemed necessary in its opinion, and if circumstances arise outside of its control. This entry was posted on Wednesday, November 6th, 2013 at 11:38 am; on the subject of Competition.